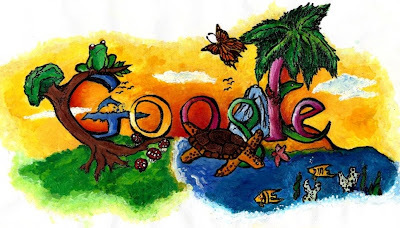 On Wednesday Google announced the winner of their Doodle for Google contest. The top prize of $15,000 a laptop and a $25,000 tech grant goes to Christin Engelberth, a sixth grader at Bernard Harris Middle School in San Antonio, Texas. Christin's winning entry titled "A New Beginning" was selected by Google users from the more than 400 state and 40 regional winners. Earlier this month Google invited users to vote for their favorites. A total of four winners where selected at a special event held at the Smithsonian's Cooper-Hewitt, National Design Museum, where Google unveiled an exhibit of the top doodles that will be on view until July 5, 2009. Engelberth along with the other three national finalists were treated to a day in New York City that included activities which promote peace, sustainability and wellness — all inspired by this year's theme, "What I Wish for the World."